This coming Sunday my teacher Dina Friedman is going to be starting a new course I am really excited about. A friend told me that Dina’s new Mastery Course is extremely life-changing and self-empowering, so I decided to sign up to take the course for this coming year (this is the third course I will be taking with Dina Friedman, I also took her year-long parenting course and her Advanced Course). I would be so happy if you would join me! –Using the power of intentions to create a meaningful and fulfilling life. –Connecting to your intuition and knowing what is truly good for you when faced with choices or conflicts. –Identifying your highest values and your unique life’s purpose. –Letting go of guilt, shame, fear or depression so that you can achieve what you want in life. –Living by the principles of authentic spirituality and experiencing miracles in your life. –Experiencing the loving presence of Hashem at all times, including during challenges. –The power you have to affect your reality, and the steps to take to do so. –Clearing mind chatter and accessing energy-giving thoughts. –Mastering your emotions so that they guide you rather than control you. –Healing after a loss or a life change. –Transforming challenging relationships or distressing experiences into a state unconditional love and gratitude. –Communicating with others effectively; getting others to listen to and meet your needs. –Mastering your marriage, including: igniting love and passion, understanding the feminine energy, and creating a fulfilling intimate life. Women have shared how, by following the techniques presented in the “Mastery Program,” they have been experienced healing from physical ailments (such as from psoriasis, eczema, stomach issues), as well as emotional and mental healing (such as from anxiety, depression). Quite a number of women who wanted to have more children have reported stories of spontaneous pregnancies after using the techniques presented in the program. –One participant shared how she had done a very big favor for someone a while back, and was very upset because this person had never even thanked her for what she had done. She followed the steps in the technique on how to let go of judgment. Just a few minutes after she genuinely let go of the judgment and hurt in her heart, the phone rang and who should it be, but the person she had done the favor for, who called to thank her for all that she had done. –Another participant said that when she joined the Mastery program, she was actually considering separating from her husband. Her marriage was in such a difficult place that she felt she couldn’t hold her marriage together anymore. But for some reason she just stayed in the marriage and decided to give it one more try. At the same time, she applied all the Mastery techniques. She said that through the work in Mastery she was totally able to turn her marriage around, come to a place of deep appreciation and love for her husband, and can’t even believe that she actually wanted to end the marriage. –Another participant shared that she is married almost 40 years. She thought she had a really, really good marriage. After following the steps on Mastery she said it was unbelievable for her to discover how much more there could be to marriage, and bringing it to a level of so much more passion and pleasure and love that she didn’t even realize was possible. Had you asked her how her marriage was before the program, she would have said it was really good; now it’s amazing, beyond words! My Favorite New Song: "Aba!" 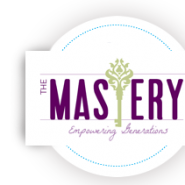 I think the mastery program is pretty similar to the advanced parenting class. Since you’ll be taking both, let us know how it compares so I know if I should take it next year.